Six-year-old Madin Mohammed from Algeria has been tipped to become the new Zinedine Zidane after he attracted the attention of top level talent scouts with his soccer skills. This boy’s skills are indeed amazing as you can see from the video. 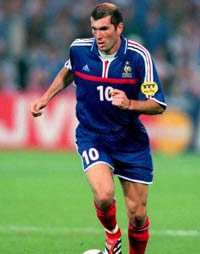 His quick moves and skillful ball control are indeed reminiscent of Zinedin Zidan who was also of Algerian origin. Madin’s parents moved to France when he was three. The boy has already been signed up to a scholarship by the national football association in France. It is reported that Chelsea and Real Madrid are thinking of tying him up with some kind of a deal. Arsene Wenger has not shown any interest and I think he probably will not. He is not really a baby snatcher as his rivals have accused him of! He has more sense than going after babies unlike some others. Drivel. It's just circus tricks. if he can do that at 18 he is gonna be a world superstar,nice to see a youngster with some technical ability. What a shame he only tries like 2 passes in the whole video, and they're both pretty poor. Then again, why the hell are we here discussing a six year old? A bloody six year old!